Time and time again, National ALD has recognized our chapter for our dedication to the spirit of Alpha Lambda Delta. Our organization has a reputation of excellence, and success continues to be a yearly tradition. We have also been recognized by Western Michigan University and the Kalamazoo community for our volunteerism. April 2013: Golden Bronco, 50th Year Anniversary. "Every year, the Student Activities and Leadership Programs (SALP) Office at Western Michigan University recognizes excellence in student organizations, advisors, and leadership with our Golden Bronco Awards." "The monthly Bronco Spotlight award recognizes student leaders, RSOs, and RSO advisors for their contribution to the WMU and local community." In November of 2014, ALD was recognized by Bronco Spotlight in two categories: RSO Most Committed to Service and Advisor of the Month, which was awarded to chapter advisor Anthony Helms. "STAR Awards (Sharing Time And Resources) celebrate the spirit of volunteerism throughout our community by paying tribute to individuals and groups who actively donate their time and talents in service to others." 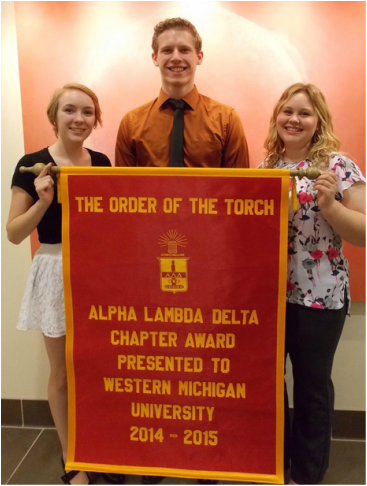 "The Order of the Torch is the annual award for the most outstanding chapters of Alpha Lambda Delta in the nation. Each year, up to five chapters may be awarded the Order of the Torch." A single chapter can receive the Order of the Torch award only once every four years, which means we will be eligible to apply for the award again in 2019. "Chapters who are awarded the Order of the Torch are ineligible to apply for the award for the next four years. To reward chapters that have continued to excel in programming, activities, and service, the National Council awards the Maintaining the Flame award to chapters who are ineligible for the Torch." This award recognizes that for the year 2014, our total membership percentage increase from the previous year was between 25 and 49%. Chapters that receive the Delta award receive discounts at the ALD national store. This award is exactly what it sounds like: in 2013, we were recognized for having the best chapter t-shirt! We hope to win this award again in the future.